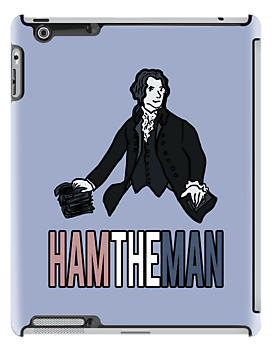 Hamil-Swag: Tech Accessories – It's Hamiltime! 1) Computer Sleeves: protect your computer with this stylish Hamilton computer sleeve! 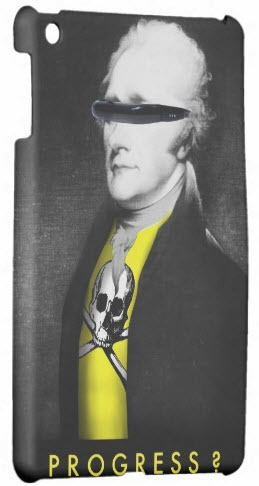 The product description states: “Hamilton’s Federalist essay #74 adorns this laptop case. This one-of- a-kind item has images of original 1st edition pages from “The Federalist,” 1788, from my collection. There’s also an 18th century notation attributing the essay to “Gen’l Hamilton” on the right.” This sleeve is available from Zazzle for $27.95. Ham the Man cover from Red Bubble (this one is pretty pricey at $69.23, but I think the design is pretty cool!). “Those who stand for nothing fall for anything.” The cover features one of my favorite Hamilton quotations (it’s actually my Gmail signature), and I like the color scheme on this one. The case is available from Cafe Press for $24.99. Alexander Hamilton: Progress? Interesting design from Cooldesignz Founding Father’s collection, available on Zazzle for $49.95.